In 1907 William and Harry Boyd bought an Ideal Block Machine to build their father’s new home – and just like that Boyd Bros Concrete was born. It made one block at a time that had a decorative, stone-like finish. Now offering a high quality product, the company soon took off and they quickly increased their product line to include an exposed aggregate block which they made into the late 1960’s. 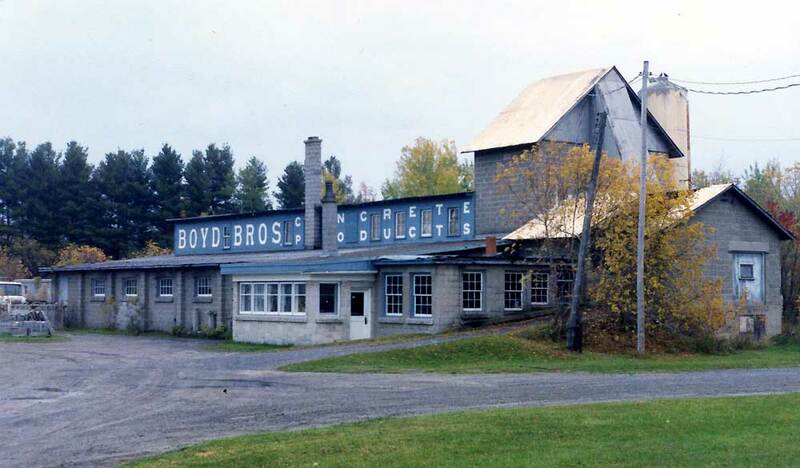 These particular blocks became known throughout the Ottawa Valley, simply as, Boyd Block. During WWII cement was in short supply and as a result, cement for the body of the block was provided by the customer and Boyd’s would use their supply of Canada Cement powder for the face, to make sure the color stayed the same. In the 1960’s Boyd Bros realized their method of making blocks was far too labor intensive. As a result, their main focus shifted from Boyd Blocks to septic tanks and other related products. In 1978 the Schoenfeld Family purchased Boyd Bros when no one from the Boyd family wanted to take over. From there, Peter Sr. and Jr. carried on making septic tanks and eventually expanded into septic pumping as well. Over the next 25 years, Boyd Bros grew as did the Schoenfeld family’s involvement. Jason, Peter’s eldest son, started out working summers and after school making their local deliveries. In 2000, Peter’s son-in-law, Rob Sanna joined the team fresh out of University, where he’d earned a Bachelor of Engineering (Mechanical) degree. Shortly after, Peter’s youngest son, Geoff, came on board with his newly obtained Tool and Die Making certificate. With new skills among them, the company had a new vision and was on the move again. They began making their own concrete forms, while always searching for new ideas to try to improve their ‘way of doing it’. As a result, they were able to integrate pneumatics , hydraulics, and other advanced principles into their work. After partnering with advanced treatment companies, Boyd Bros quickly became the leader for complete septic systems in Eastern Ontario. In October 2011, Boyd Bros moved into a newly built facility. Now, fully equipped with an overhead crane and state-of-the-art batching plant, Boyd Bros was pushing forward, again. Product lines increased and new ones came to life as their presence in the farming and wastewater markets became well-known. Since then Boyd Bros has expanded further, moving into big block retaining walls, becoming the only Eastern Ontario dealer for The ReCon Retaining Wall system. The future holds many opportunities for The Boyd Bros team. We are determined and committed to be the best at what we do. Want to learn more about Boyd Bros Concrete history? Have a look at the stories below!